Over the last few weeks we’ve had the pleasure of testing Rockwell Tools new H3 12 Volt Cordless SDS Rotary Hammer. We first got a chance to see the H3 over the winter at the International Builder’s Show and it was one of the new tools that impressed us most. 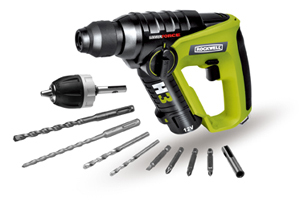 The all new H3 is part of Rockwell’s extended family of 12-volt lithium-ion power tools, which includes a 3-in-1 Impact Driver, drill/driver, screwdriver, impact driver and SoniCrafter®. Over the last couple of weeks I’ve spent some time testing this cool new tool along with one of my crews at work. We use a wide range of cordless drills, impact drivers and rotary hammers on our construction projects so we were eager to put this one to the test. Probably the most striking feature right out of the box is the 3.1 lb tool weight. Some of the heavier 18V rotary hammers that we use weigh as much as 7 lbs which makes this little guy truly a light weight. However, don’t let the light weight fool you. The H3 packs quite a punch for a 12V cordless tool. We tested it by drilling holes in concrete block, reinforced concrete walls, wood and even some steel. We also tested it driving some concrete screws into concrete blocks. In addition to the rotary hammer mode (you can easily switch between rotary hammer and drill mode by turning the dial on the side of the housing) the H3 can be used with the traditional 3-jaw chuck that attaches to the SDS chuck. This allows the user to easily switch over to traditional driver bits and drill bits. The Rockwell H3 12V Lithium 3-Function Rotary Hammer Drill is part of Rockwell’s Free Batteries for Life program, which reinforces the company’s confidence in the quality of its batteries and cordless tools. Registered users never need to worry about buying new batteries because Rockwell will replace them free for the life of the tool. The Free Batteries for Life program reduces the overall cost of owning a Rockwell cordless tool by 40 to 70 percent. Another really cool feature is a built-in USB port for charging electronics. Seems like I’m forever looking to plug in my new smart phone with the USB charger and this is just one more place to conveniently plug it in! Don’t let the H3’s small size and weight fool you. 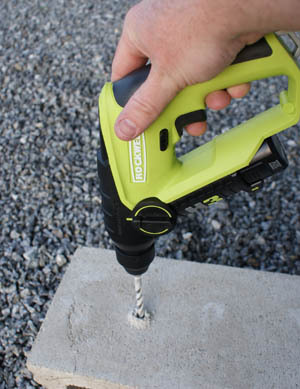 The H3 is able to easily drill holes in concrete, masonry, wood and metal. While this tool isn’t going to be drilling large diameter holes it is able to drill smaller holes needed for fastening projects like installing hangers, brackets and light duty fastening systems. Where the H3 really shines is in the diversity of applications that it can be used for. Users can quickly go from drilling holes in masonry and installing Tapcon fasteners in brick to drilling holes in wood and installing sheet metal screws in duct work. The other impressive quality is having a true SDS chuck to help deliver effective drilling power in tough materials. If we have to find a place to pick on the H3 it would be in two areas. First of all the battery life in rotary hammer mode is fairly short. While drilling in masonry we were able to drill 12 to 16 holes (3/8″ diameter). This isn’t great but then again it’s not horrible. The other issue we would like to see improved is the tools balance especially when using the traditional 3-jaw chuck. As you can see in the photo above the drill becomes quite long and “front” heavy. This isn’t a deal breaker but it does make the tool less comfortable. We really like the H3 for anyone doing lighter duty tasks. This is especially true for home owners and DIY’ers looking to get into the rotary hammer tool line. You can buy this tool and have a rotary hammer, drill driver and drill for a very reasonable price. Priced at just under $180 it’s a good value. You can buy it online at www.rockwelltoolsdirect.com and it should be available at local hardware stores this summer.